All of my aunts and my lone uncle are super-talented people. My Uncle Bill can make anything you dream up out of wood. My Aunt Lenora makes perfect roman shades. Both my mom and Aunt Ruth sew, sew, sew as well. But Aunt Catherine paints. 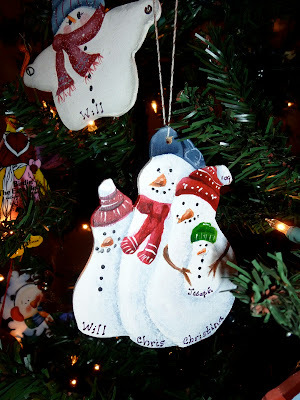 And every year since 1993, she has made ornaments for the family. If I had the room, I would have one tree dedicated to just her ornaments. I think last year she estimated she's painted around 200 designs. Because we don't all get the same ornament. So I look forward each holiday to seeing our ornament and now to seeing the boys' ornaments too. I'm impressed every year and well, I hope you don't mind me bragging a bit about her talents. This year Aunt Catherine made a gingerbread man for each boy. And she brought her special copy of "Richard Scarry's The Gingerbread Man" to read to them. It is now officially on loan to us until grandchildren arrive. See the little gingerbread boy tucked into the apron on my ornament? I'm the Gingerbread Mom. 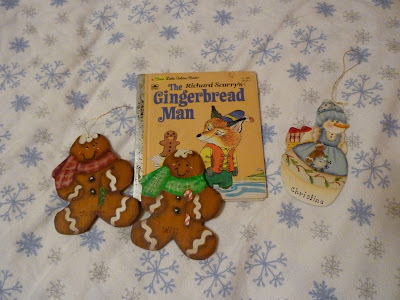 And my mom's ornament was similar so she's the Gingerbread Grandma. If I had to name a favorite Catherine ornament, this one from last year would probably be it. Especially since it was Joseph's first Christmas and he's the snowbaby. Above is Will's ornament from 2007. 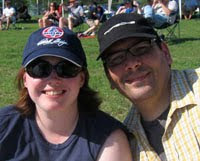 And you can see a small snowman face peaking at the bottom I think from 2006. So that's who you get all your craftiness from? Very cool. THE BOOK I WAS SUPPOSED TO BE RUNNING WAS THIS ONE!!!!!!!!!!!! Cosmic!! Mine has a different cover though, I think it was reprinted! These ornaments are AMAZING!!!! Really, it's the end of the year?